I spent 3 days at Bandipur over the past weekend. With weather oscillating between sunny and rainy, it was an interesting trip. Having seen Sloth Bears, a Bengal Tiger and a few Indian Elephants over the first 2 days, I was looking forward to the last safari. With heavy rains in the night and a very cloudy (and chilly) morning, imminent rain threatened our safari plans. Didn’t realize that the raindrops would start very soon into the safari. As the light drizzle went on and on (almost till the safari ended), it also gifted us some lovely photography opportunities. 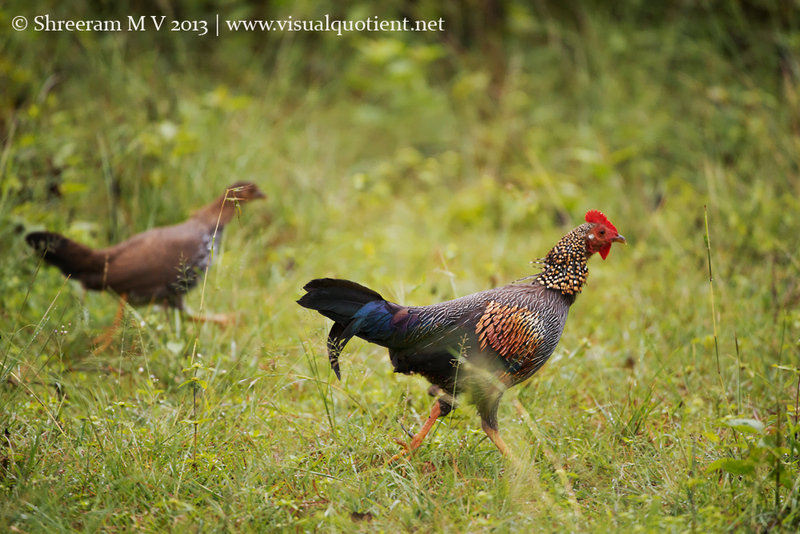 First up was this Grey Junglefowl pair walking along the safari track. And then it started drizzling. 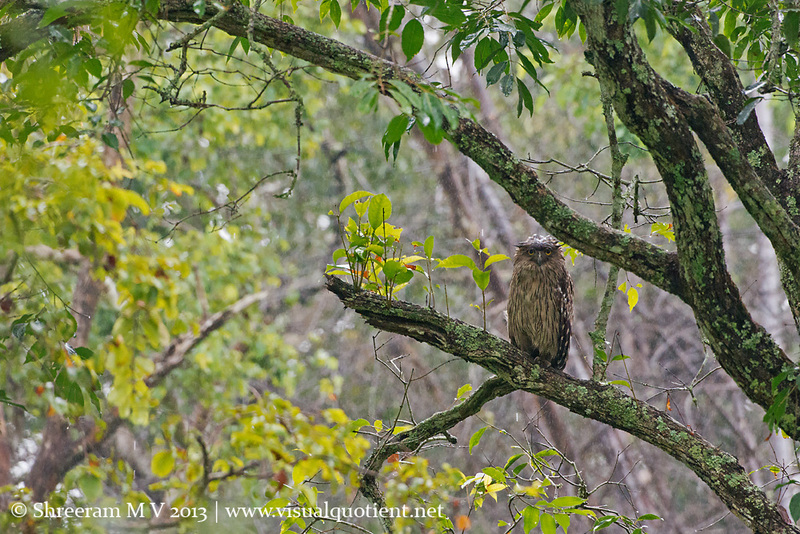 We came across this Indian Peafowl perched upon a dead tree. With all but 2 of his tail feathers shed, he was ready for winter. 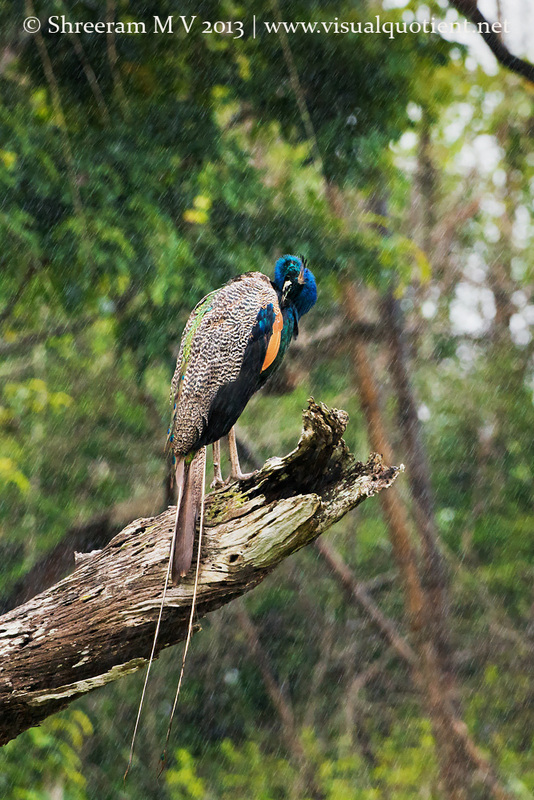 As he started to get drenched, the Indian Peafowl started setting his feathers straight (preening). 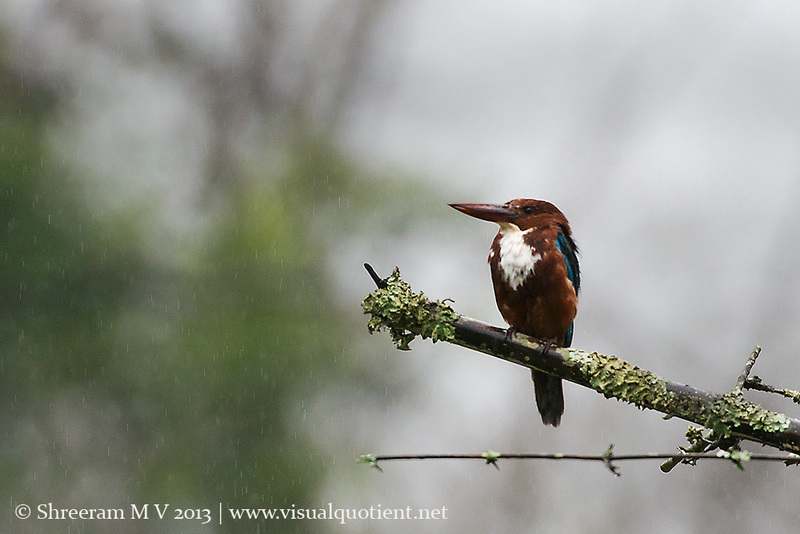 A short distance away, a White-throated Kingfisher also seemed to be enjoying the rains. 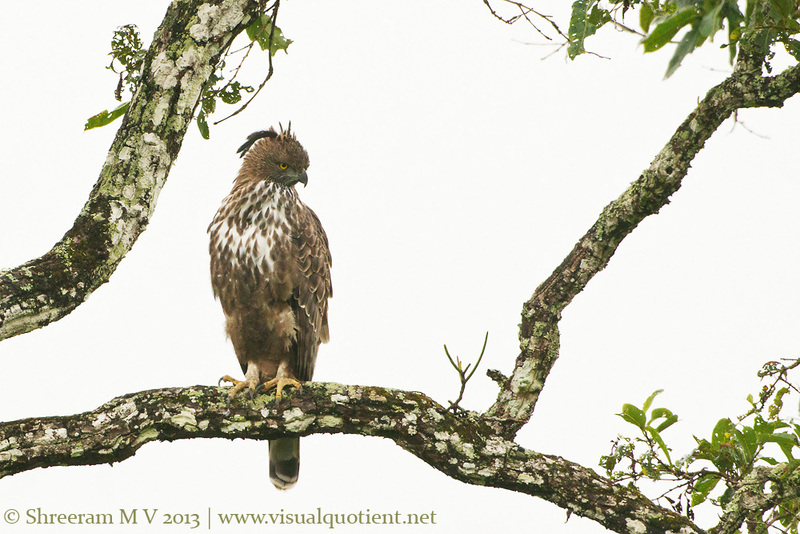 A Crested Hawk Eagle protected itself from the rain in the shade of a tree. The cloudy sky ensured that the background went completely white. Now, I am not much into high-key portraits and I’d almost discarded this photograph. But when I looked at the lichen-decorated branch, I thought this photograph should make it to the post. The feathery look of the large Owl has always reminded me of an old sage. The drenched look, however, looked closer to a naughty schoolboy 🙂 What do you think? 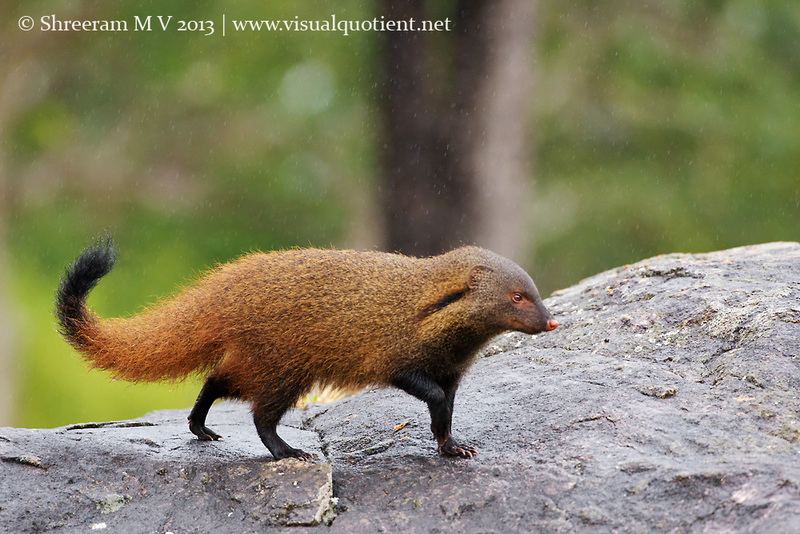 This Stripe-necked Mongoose (the largest of the Asiatic mongooses) was running around busily by the track looking for a morsel. 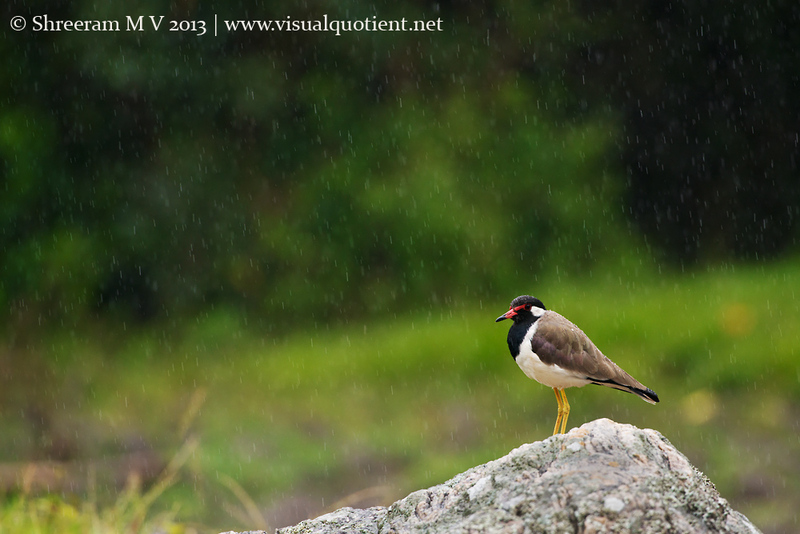 The “Did-you-do-it” bird (Red-wattled Lapwing) also obliged us with some nice rainy portraits before we headed out of the park. Don’t be disappointed if it starts raining. Look around and you’ll witness an amazing transformation. Even common subjects (as pictured in this post) can provide fresh perspectives in the rain. Go ahead and play around with the settings to capture a variety of photographs. 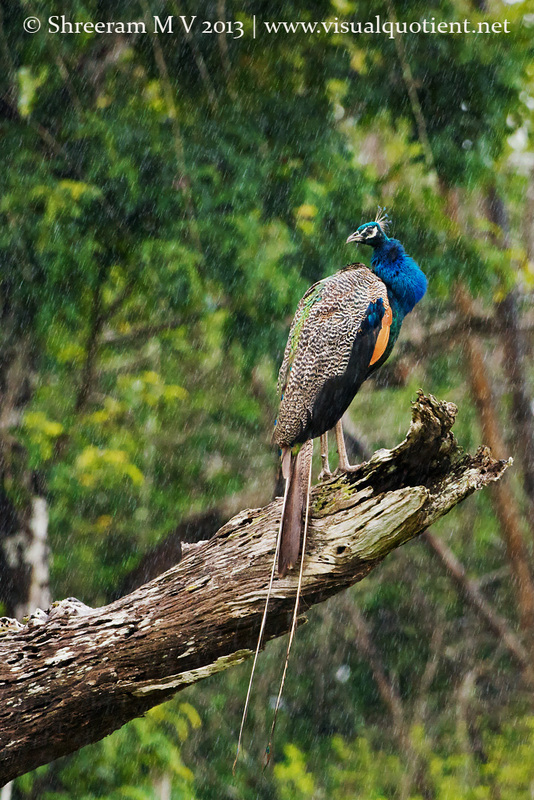 A steady drizzle helps you capture the animal with the raindrops in the background the best. Use faster shutter speeds to show drops of water and slower shutter speeds to show streaks of water. For example, my Peafowl photographs were shot at 1/250 s (to show light streaking in raindrops) while my Red-wattled Lapwing photograph was shot at 1/400 s (to freeze the rain drops). Of course, the exact shutter speeds depend on how heavy the rainfall is. Keep your photography gear dry. If the rain is heavy, keep it inside your bag and enjoy the view for a change 🙂 Luckily for us, the drizzle was relatively light throughout. Don’t change lenses on your camera. One stray droplet of water could shut your whole camera system down and set you back by a few thousand bucks. Would like to hear your experiences on a rain-filled safari and more tips on photography in the rains. Love the photographs with the rain drops as the backdrop! Gives such a cool and different feel! to all the pics. Thanks for sharing the photography tips too, Shree. Lovely shots as usual…yes, we too find that the rain, if you brave it, provides great opportunities in the forest! I remember several safaris where sightings poured as much as the heavens! Fabulous Frames and seeing the forest turn green after such a long period of gap was exhilarating experience. Getting drenched in wilderness is indeed a privilege . Thank you for sharing. Thanks Bikash. It was great to meet you at Bandipur.